So it’s come to this. 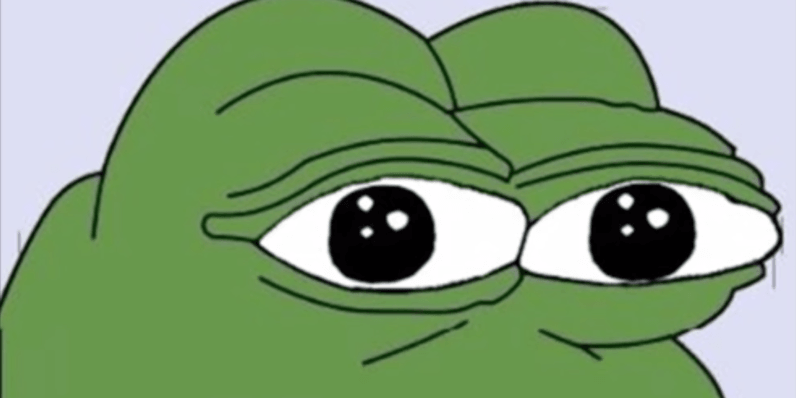 The Hillary Clinton campaign decided it was important to explain an internet meme this week, in a blog post that calls out Pepe the Frong as a symbol of white supremacy. The post discussed a picture shared by Donald Trump Junior, son of the Presidential candidate, on Instagram. The image puts Pepe behind Donald Trump, and alongside such political luminaries as Alex Jones and Milo Yiannopoulos. The Clinton campaign decided pointing out Pepe was the important thing here. This isn’t inaccurate. The Daily Beast outlined how white supremacists used the meme back in May, and anyone who explores the seedier parts of Reddit has seen Pepe adorned with swastikas at this point. Still, it’s really weird to see this kind of internet obscurity seep into mainstream political discussion, but at this point nothing about this election should be surprising, so whatever. I didn’t know what white nationalists were until, like, yesterday. And the alt-right or whatever? It’s all very new and very strange and definitely not something that I support. Back in 2005 Furie used the character in a series of Microsoft Paint comics posted on MySpace. 4chan users started posting the frog regularly a few years later, warping into all kinds of different memes the way only 2008 4chan could. From there the internetized version of the character spread to all corners of the web; the white nationalist version is just the latest incarnation. Furie says he only found out about his character’s popularity with white supremacists because people keep sending pictures to him. And who does Furie himself support? Well, I was really excited for Bernie, and that fizzled out, so I guess I’m gonna have to take one for the team for the team and go for Hillary even though she’s talking smack, or whoever’s writing for her at the moment is talking smack about Pepe. Not exactly a ringing endorsement of Clinton, granted, but it seems like Pepe’s creator isn’t a Trump supporter either.